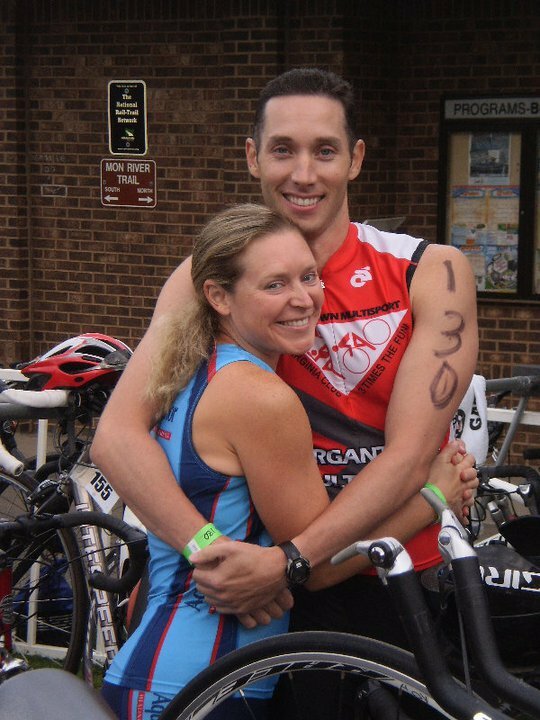 On Wednsday, August 31st, Morgantown Multisport will host an auction to raise funds for Morgantown’s own Lori Sherlock to compete in the 2011 70.3 Ironman World Championship Triathlon in Las Vegas, Nevada and the 2011 Ironman World Championship Triathlon in Kona, Hawaii. By making a donation, your business will help to provide Lori with funds for travel, lodging, and entry fees for these events. Lori Sherlock—a Star City native and WVU professor—is the only West Virginian that will compete in either of these World Championship triathlons. These invitation-only events are reserved for the world’s best triathletes, and Lori has qualified to compete on both international stages. The race includes a 2.4 mile swim, 112 mile bike, and 26.2 mile run for the full Ironman, and a 1.6 mile swim, 56 mile bike, and 13.1 mile run for the 70.3 Ironman. While it takes a tremendous amount of discipline, stamina, and athletic ability to compete in these races, it also requires a large monetary investment by the athlete. Plane tickets, lodging, food, the shipping of equipment, and entry fees are some of the larger costs associated with this incredible sport. To help offset these costs, Morgantown Multisport will host a live Bachelor/Bachelorette auction at the Morgantown Brewing Company on Wednesday, August 31st at 8pm. At this event, dates with prominent area singles will be auctioned off to the highest bidder. We have a large number of volunteers excited to donate their time for these dates, and we are now looking for local businesses like yours to donate dinners for two, movie tickets, bike rentals, car/limo rentals, and other fun and unique things to do on a date. We will also hold a silent auction at this event—many businesses donate items such as gift baskets, spa items, gift cards, art, jewelry, sport-specific clothing, etc. Cash donations are always welcome, and will either go towards funding the event, or go directly toward reaching our goal. Our goal is to raise $5,000 for Lori—this would cover a majority of her travel costs and allow her to compete with the best triathletes in the world, at the most prestigious triathlon events in the world. By donating your products, services, or hard-earned money, you can support one of the world’s top athletes and the girl next door. All donors (or contributors) will be honored with inclusion in a directory that will be given to all attendees of the benefit auction. Information will include business name, address, phone number and specialty. Businesses that contribute a substantial monetary donation will also be included on Lori’s race jersey that will be worn at both World Championships. It is truly hard to comprehend that Brian and I have been competing in Ironman Lake Placid for five years now. The event and the town just seem to keep drawing us back for more. This year, however, was a little different for me. From the onset of training in February, there has been an intensity and urgency that has accompanied every workout to ready me for the start line of this race. I was lucky enough to experience success last year – I had a great race and a solid outcome: 12th in my age group. It made me wonder if I could go fast enough to qualify for Kona, the Ironman World Championships in Hawaii. Ever since immersing myself into the sport of triathlon, Kona has been a reclusive dream that has seemed unattainable. After all, the world championships are just for pro-athletes and super-humans…right? To even allow myself to realistically dream about racing in Hawaii creates a likely opportunity for heart break. After speaking to my coach on several occasions, weighing the training volume and the sacrifices that I would have to make during the training year, and receiving a supportive blessing from my family, I decided that I was going to go for it. I knew that the training would be different and that I was going to have to rethink my eating habits in order for the entire picture to come into focus. I met with one of my good friends, Nettie, whom is a dietitian for the athletes department at WVU to help me get a handle on my diet. Brian and I have always eaten relatively healthy…just a lot of quantity. It was part of the reward for training for so many hours every week – freedom to eat and indulge (specifically Dairy Queen). That was going to have to change in order for me to get down to a more competitive racing weight. Nettie helped me to determine how many calories I should be allowing myself on a daily basis and educated me on the breakdown of protein, fat and carbohydrate ratios that I should be shooting for. The diet was going to be the hardest part…I love food and my family is often defined by it. Over the course of the next 4 months the calorie restrictions were in force and allowed me to drop around 10 pounds and get me race ready. It was not an easy job and I have to say that I appreciate the efforts that weight loss takes much more now that I have experienced it. I tested the waters with a few races including a ½ Ironman in Florida, ½ marathon in Lake Placid and a ½ Ironman in Morgantown….all of the results were promising so I let myself dream about Kona. I knew that I was going to have to have the perfect race to qualify….but anything is possible. Driving into Lake Placid, I could feel my emotions sitting on the surface ready to catch me off guard at any given moment. I misted up a little during my first easy run around the lake and went into a full-tilt sob when I found a broken hub on my rear wheel. The wheel-drama sent me into a tail-spin but thanks to my awesome family and my good friend Lorraine, I was able to get my regular wheel delivered to Lake Placid in plenty of time. With that disaster behind me, I was able to refocus my energy and efforts towards the main event. I studied my age group times from the past five years to get an idea of just how fast I needed to go….it was really fast. I packed up my gear bags and special needs bags with simplicity and speed in mind – nothing extra, just the essentials to get the job done. Pelẻ, my bike, was clean, oiled, waxed and ready to ride fast. Everything was in place. Now I just needed to lay down a great race. Awaking at 4:15am to the sound of the alarm, I looked over at Brian and we said to one another “it’s race day!” A very large NYC bagel with peanut butter and jelly made for a calorie-packed race day breakfast. I slathered myself in Aquaphor, put my race kit on, gathered the rest of my gear and we all headed to the transition area. We had a really fun group of people racing with us this year, our good friends Bill & Duda. The transition area is an interesting place. There are 2 kinds of people that you see in transition: ones that are quietly contemplating their day and others that want everyone to know who they are and what they plan to do. I am a contemplator. I like to keep to myself, get my tires pumped up, check my gear, get my body marked and have a clear head before I step into the water. Any way you look at it, Ironman is a long day. Covering over 140 miles swimming, biking and running comes down to survival, trying to wrap my head around racing the 140.2 miles was beyond challenging so I needed mental serenity and fortitude during the pre-race hours. Walking into transition we heard the news that the swim was going to be wetsuit optional. What this boils down to is that if you wear your wetsuit, you cannot be eligible for age group awards or Hawaii qualification but you would still be an official finisher. This was an obvious decision for me – no wetsuit. I had my wetsuit draped over my arm but had to make it back up to the condo and change it out for my speed suit (I didn’t bring my speed suit originally…thank goodness for my amazing family and friends….again!). No problem, plenty of time…and this means that I don’t have to use the porta-jon….BONUS! Speed suit on and ready to go, our group took a pre-race picture, said a little prayer and headed to the swim start. This is usually the time when the years worth of training surfaces as tears of joy, fear, excitement and every other emotion all rolled up into a final moment prior to the gun going off…not this year. I was too focused on what needed to be done (not to mention I may have cried all my tears out with the wheel incident). Entering the water with the thousands of other competitors, I was focused on working hard the whole day, pushing my body to work towards a mild level of discomfort for the swim and bike and maybe a little past that for the run. I worked my way towards the front of the swim start near the buoy line and it was chaos. Arms, legs and bodies mangled and tangled trying to keep a vertical position, preferably with their head out of water. All I could do was flutter kick and move my arms from the elbow down…I kept thinking that I was spending too much energy just before the swim start…I was desperately missing the buoyancy from my wetsuit. The cannon sounded and the race was on! The first quarter of the swim was an energy sink. I felt like I was fighting more than I was swimming. I finally found some open water on the inside of the buoy line and decided that this would be a great place to stay. I spent the rest of the swim on the inside of the course (except for the turning buoys – picture a shark feeding frenzy…that is kinda what it looked like) and felt like I had posted a solid non-wetsuit swim. 1:06…not what I was looking for if I would have worn a wetsuit but without one…it was an okay time. People were crowding both sides of the chute that led the athletes to the transition area. I ran through enjoying every cheer before entering, grabbing my gear bag and heading into the changing tent. I nicely barked out orders to the 2 ladies helping me in the tent. “I need my shoes, helmet, sunglasses, gloves, socks.” I exited the tent ready to mount the bike and put down a solid ride. Running in bike cleats is a little challenging but you figure out a way to make it work. Running towards my bike I was yelling out my number to the volunteers – if they hear you they will have your bike waiting for you at the end of your row. As we all know, I have the gift of noise so they didn’t have any problem making out my number. I ran my bike out of transition and hit the road turning my pedals over as quickly as possible. I was amazed at how quickly the first loop of the bike went. Before I knew it I was grabbing my fuel for the second round and jamming a PB&J in my mouth. The second loop went almost as quickly. Climbing Whiteface mountain the second time wasn’t nearly as much fun but it was okay and I still felt strong…just a bit more tired. I hit the bike finish at 5:52 – I was happy with that…under 6 hours! One more event….just keep it together!! T2 was a quick change: new shorts, shoes, visor and Garmin and I hit the ground running. My Garmin didn’t cue up as quickly as I wanted it to so I took off in hopes that it would catch up with me. When it did, it told me loud and clear that I was running WAY too fast…6:30 pace….SLOW DOWN! I brought my pace down to a place I thought I would be comfortable at for a while and cruised through the first half of the marathon. The turnaround came so quickly and I was just praying that the wheels didn’t fall off for the rest of the run. I made my way up the two infamous climbs on the course on my way back to town the cheers and yelling made it feel easier. There was one group at the top of the second hill that yelled “Go team Aquaphor…no chafing for this athlete!” That made me laugh a little J. Everything was feeling good and I was on my second loop…13.1 miles to go…just keep it together!! I flew down the first series of hills and started making my way through the out-and-back one more time. I saw Brian and he gave me some motivation by yelling at me: “go get that fu*king slot!” It was the PERFECT thing to say….I love my husband! Then I hit mile 20….the run was starting to really hurt and breathing was becoming a challenge. “I just have a 10K left…I can do this.” The funny thing is when I do self-talk….well, I talk out loud. I was still moving through people and that was giving me a boost but my body was really pissed. I was hot and was taking whatever they were selling at the aid stations. Water – yes, Perform – yes, gel – yes, wet sponges – yes…give me what you got, I have to make it to the finish line! I was on the final stretch before I made the turn into the oval and I was searching for another gear but it was nowhere to be found…then I hit the crowd. The loud roar of the cheering fans took me to that last gear. I picked up my pace and pushed into the oval passing one more girl along the way. I put down my fastest Ironman, managed to squeak out a 3:45 marathon and finished with a time of 10:52. It was good enough for 5th place in my age group and 25th overall female (including the pros J)….and yes, I made it to Kona. World Championships here I come!!! !